7 Live - Laugh - Love Your Home! 9 Life's Too Short For Average Homes. 11 Don't Move. Be Moved. 12 There's no one better to address your address. 13 Its time to Move from your house, to your Home. 14 Don't Just Sell The House. Let The House Sell You. 15 We have Realtors talking. And homeowners speechless. 16 Nothing sells better than potential. 17 We make realtors good. We make houses look great. 18 You List. We Listen. 19 Don't sell the house they see. Sell the house they want. 20 Homeowners Get Their Wishes. You Get Their Admiration. 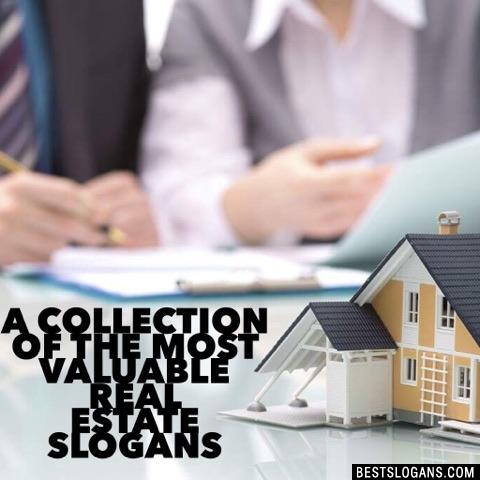 Can you think of a good Real Estate Slogans we're missing? Or come up with a clever one of your own. Please share below.